Is Quantum Computing Beyond Physics? More exactly, do we know, can we know, enough physics for (full) quantum computing? Before some object that physicists are better qualified than mathematicians to talk about the Quantum, let me point towards someone who is perhaps the most qualified experimentalist in the world on the foundations of Quantum Physics. Serge Haroche is a French physicist who got the Nobel Prize for figuring out how to count photons without seeing them. It’s the most delicate Quantum Non-Demolition (QND) method I have heard of. It involved making the world’s most perfect mirrors. The punch line? Serge Haroche does not believe Quantum Computers are feasible. However Haroche does not suggest how he got there. The article in the AMS does make plenty of suggestions to that effect. Let me hasten to add some form of Quantum Computing (or Quantum Simulation) called “annealing” is obviously feasible. D Wave, a Canadian company is selling such devices. In my view, Quantum Annealing is just the two slit experiment written large. Thus the counter-argument can be made that conventional computers can simulate annealing (and that has been the argument against D Wave’s machines). “It is often claimed that quantum computers can perform certain computations that even a classical computer of the size of the entire universe cannot perform! Indeed it is useful to examine not only things that were previously impossible and that are now made possible by a new technology but also the improvement in terms of orders of magnitude for tasks that could have been achieved by the old technology. The decision between the optimistic and pessimistic hypotheses is, to a large extent, a question about modeling locality in quantum physics. Modeling natural quantum evolutions by quantum computers represents the important physical principle of “locality”: quantum interactions are limited to a few particles. The quantum circuit model enforces local rules on quantum evolutions and still allows the creation of very nonlocal quantum states. Just for future reference, let’s “note that with quantum computers one can emulate a quantum evolution on an arbitrary geometry. For example, a complicated quantum evolution representing the dynamics of a four-dimensional lattice model could be emulated on a one-dimensional chain of qubits. I have proposed a theory which explains the preceding features, including the emergence of space. 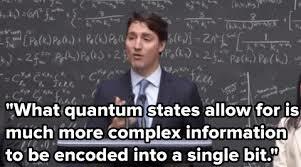 Let’s call it Sub Quantum Physics (SQP). The theory breaks a lot of sacred cows. Besides, it brings an obvious explanation for Dark Matter. If I am correct the Dark matter Puzzle is directly tied in with the Quantum Puzzle. In any case, it is a delight to see in print part of what I have been severely criticized for saying for all too many decades… The gist of it all is that present day physics would be completely incomplete.